Cagliari and its blue skies. Cagliari and its coloured houses and roofs that seem for all the world like little splashes of red ink. Cagliari and its promenade. Cagliari and its lagoons, which become a refuge for flamingos and black-winged stilts. Cagliari and its quarters, with their narrow streets and and buildings so close together they risk touching each other. Cagliari and its squares, which transform into open-air salons, filled with coffee bars and ancient trees affording shade. Cagliari and its harbour, which rises proud and welcoming to those visiting the city. 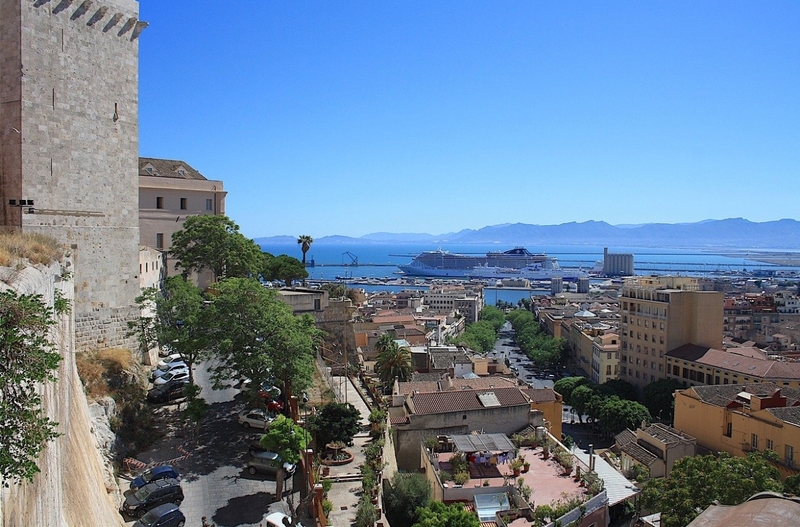 Cagliari is an unusual city – as is its history and as are its people. It is a city that over the centuries has been invaded time and again, but which has nevertheless somehow managed to retain its own identity, transforming it and creating a new, entirely original soul. It is built on seven hills, like the eternal city. And every hill represents a district or a piece of Cagliari's history. In the same way, every district recounts both a characteristic of its inhabitants and their take on life: Marina, the old district of the fisherfolk, with its constant swarm of people and perfumes; Castello, with its intricate alleways that weave themselves into a maze of ancient buildings, noble facades and little boutiques; Stampace, the home of Hotel Flora, which at one time houses craftspeople, merchants and the petit bourgeoisie. Every corner of the city seems to want to suggest a new itinerary to explore, almost as if it were an invitation to steal a glimpse and save it amongst your memories. The Flora is located in the area that is really the beating heart of Cagliari. It is the area that overlooks the harbour and its ancient noble palazzos, which look out to sea. From here, you can easily get to every part of the city and the surrounding area. It is from here that the trains depart to take you to destinations throughout Sardinia. The same goes for the buses, which can take your on sunny summer days along the Poetto seafront towards the wonderful beaches of the neighbouring coastal resorts of Chia and Villasimius. Let yourself be carried away by the buzzing atmosphere of the city and kick-start your holiday, taking as your starting point this part of town and the nearby Piazza del Carmine, before immersing yourself into the alleyways that criss-cross the main drag of Corso Vittorio Emanuele, which the locals used to refer to as “Sa passillara” (the promenade) and head off in search of the crazy signs, scattered here and there throughout the city, of one of the most important symbols of Sardinia as a whole: Saint Ephesus, who, as well as being our Patron Saint, is our greatest source of pride. We're sure that Cagliari will surprise and excite you, and so we'll do our level best to tell you as much as we can about us on the pages of our website, so that you can discover and fall in love with this city that overlooks what has been instrumental in its history – the Mediterranean Sea.